Out this week from BOOM! 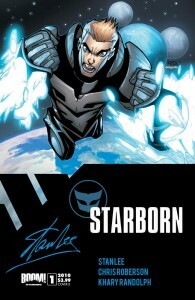 Studios, Starborn is one of the three books the company is launching with ideas by the master of Marvel storytelling, Stan Lee himself. This one comes with an intriguing premise: Benjamin Warner is an unpublished writer, who has been building a science-fiction world ever since he was a child. He finally sent off his first novel to a publisher…and suddenly discovers that what he thought was science-fiction — not to mention all in his head — is in fact very real. And because of what he knows, it wants him dead. The first issue is mostly exposition, but there’s enough action at the beginning (in the sci-fi setting) and at the end (in reality) to keep things moving. Some elements seem a bit too familiar for someone who’s read a lot of science fiction, but there’s enough going on…and enough left unexplained…to be intriguing. The art style doesn’t really grab me, but I do like the contrast presented between the sci-fi elements and the ordinary world. It may grow on me. Verdict: Definitely worth a look! I’d like to know more about the world, and the lead character’s role in it, as well as where the story might go. Update: CBR has a preview of the book. And I forgot to mention: Impulse fans might be interested in the variant cover by Humberto Ramos. A digital review copy was provided by the publisher. 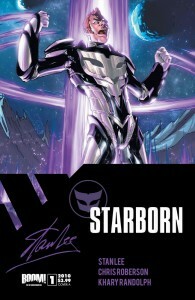 This entry was posted in Other Comics, Reviews and tagged Chris Roberson, Khary Randolph, Stan Lee, Starborn on December 7, 2010 by Kelson.